What’s Cooking America’s Classic Caesar Salad Recipe. NOTE: As I can not find any historical references to back this story, is it a myth or fact? Definition of myth – A story containing within and having about it certain identifiable characteristics that are sometimes use to designate a story or the understanding of some matter as fictional and even downright false. You be the judge. “Caesar salad was invented in about 1903 by Giacomo Junia, an Italian cook in Chicago, Illinois. Giacomo Junia was the cook in a small restaurant called The New York Cafe. He catered to American tastes as spaghetti and pizza in those days were little eaten by anyone including Italians. It is sometimes falsely stated that this salad was invented in Tijuana, Mexico during the prohibition period and also in San Francisco. Nothing could be further from the truth. The only thing invented in Tijuana were the finest methods every produced to clip tourists. 1924 – Most historians believe that Caesar salad honors restaurateur Caesar Cardini (1896-1956), who invented it in Tijuana, Mexico in 1924 on the Fourth of July weekend. It is said that on this busy weekend, Cardini was running low on food and he put together a salad for his guests from what was left over in the kitchen. His original recipe included romaine, garlic, croutons, and Parmesan cheese, boiled eggs, olive oil and Worcestershire sauce. The original salad was prepared at tableside. When the salad dressing was ready, the romaine leaves were coated with the dressing and placed stem side out, in a circle and served on a flat dinner plate, so that the salad could be eaten with the fingers. In 1926, Alex Cardini joined his brother, Caesar, at the Tijuana restaurant. Alex, an ace pilot in the Italian Air Force during World War I, added other ingredients, one of which was anchovies, and named the salad Aviator’s Salad” in honor of the pilots from Rockwell Field Air Base in San Diego. It is reported that Alex’s version became very popular, and later this salad was renamed “Caesar Salad.” Caesar was said to be staunchly against the inclusion of anchovies in this mixture, contending that the Worcestershire sauce was what actually provided that faint fishy flavor. He also decreed that only Italian olive oil and imported Parmesan cheese be used in the dressing. Over the years, it became quite the thing to do – to drive to Tijuana for a Caesar Salad. Californians, including Hollywood celebrities such as Clark Gable, Jean Harlow, and W.C. fields dined at Caesar’s to escape the Prohibition laws in the U.S. 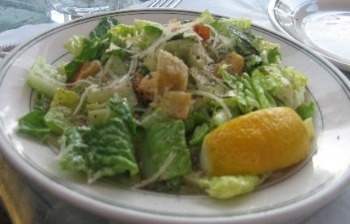 In Europe, Caesar’s Salad was also appearing in restaurants. It is also that that as a result of Mrs. Simpson’s extensive world travels, Caesar Salad was introduced to many of the great European restaurants by her instructing international chefs as they struggled to recreate the dressing to satisfy the soon-to-be-Duchess of Windsor’s discerning palate. In 1948 Caesar Cardini established a patent on the dressing (which is still packaged and sold as “Cardini’s Original Caesar Dressing Mix,” distributed by Caesar Cardini Foods, Culver City, California. Typically a Cobb Salad consists of chopped chicken or turkey, bacon, hard cooked eggs, tomatoes, avocado, cheddar cheese, and lettuce. It is served with crumbled blue cheese and vinaigrette dressing. The original recipe for Cobb salad included avocado, celery, tomato, chives, watercress, hard-boiled eggs, chicken, bacon, and Roquefort cheese. Some historians say it was invented in 1929 and others say 1937. The official date recorded by the Brown Derby restaurant is 1937. 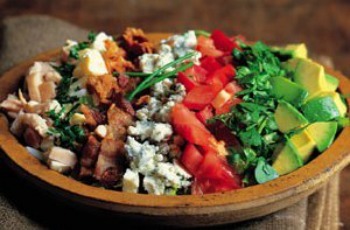 What’s Cooking America’s Classic Cobb Salad recipe. 1937 – It was the invention of restaurant manager, Bob Cobb, at The Brown Derby restaurant in Los Angeles, found a way to use up leftovers. Cobb had been improvising with the salad for years. The first one was created at the end of a long day, when Cobb realized he had not had time to eat. Wandering over to one of the restaurant iceboxes, a weary Cobb scrounged around to see what he could fix. Cobb’s salad might have remained his own little secret had he not made an offhand comment about his new invention to one of Hollywood’s legendary promoters, Sid Grauman, the man responsible for the elaborate, pagoda-like cinema on Hollywood Boulevard that came to be known as Grauman’s Chinese Theatre. The salad got Grauman’s interest and he asked for one to try. He fell in love with it. Some historians say that it was the Executive Chef of the Brown Derby Restaurant, Robert Kreis, who actually developed the Cobb Salad in honor of Bob Cobb, owner of the restaurant. You be the judge! Disney World in Florida, located in the Disney-MGM Studios, has built a replica of the restaurant where they feature the Cobb Salad and the famous caricatures of Hollywood stars which lined the walls of the original Brown Derby Restaurant in Hollywood, California. Both spellings of the salad are used on restaurant menus, but it is usually pronounced LOO-ey. 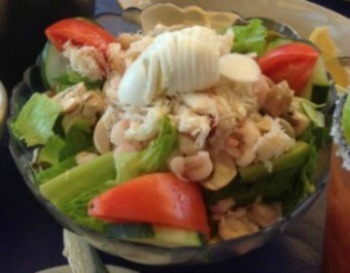 This famous west coast salad is also called “King of Salads,” and is sometimes written as Crab Louis Salad. Today there are as many versions of this famous salad as there are cooks. 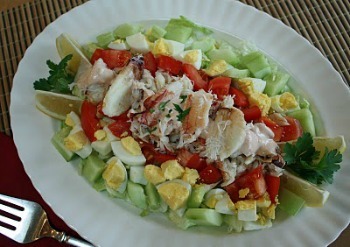 Credit for the origin of Crab Louie Salad depends on who you talk to and which state of the West Coast you are in. Most historians agree that the salad began appearing on menus of finer West Coast establishments between the turn of the 20th century and World War I. Other historians suggest that the salad was named after King Louis XIV who was known for his enormous amounts of food he could eat. After his death, it is said than an autopsy was carried out and it revealed that his stomach was twice the size of that of ordinary men. You be the judge. Most prosaically, in those years his mother would take her son to restaurants that served food aimed at pleasing the average Oregon palate. One of these was the Bohemian, a commendable dining place that Beard remembered particularly for a dish called Crab Louis. Writing about this chili-tinged way of serving Dungeness crab, he wanted to believe it had been first served at the Bohemian and later he sparred with his friend, Helen Evans Brown, who credited San Francisco’s Solari Restaurant for its origin. A cold salad made with shredded cabbage mixed with mayonnaise as well as a variety of ingredients. The term coleslaw is a late 19th century term, which originated in the United States. Cole slaw (cold slaw) got it’s name from the Dutch “kool sla”- the word “kool” means cabbage and “sla” is salad – meaning simply, cabbage salad. In English, that became “cole slaw” and eventually “cold slaw.” The original Dutch “kool sla” was most likely served hot. Panzanella salad always includes bread and tomatoes plus vegetables from the garden. Vegetables can include peppers, cucumbers, and onions. Lots of garlic, capers, black olives, and anchovies are added to the salad. This Italian salad probably was an invention of necessity. Italian cooks waste nothing and this was a way to utilize stale bread and vegetables from the garden. The record of panzanella goes back centuries. In the 1500s, a poem by the famous artist, Bronzino, described the salad. Of course, the tomato was quite a few years from being introduced into the Italian kitchen, so the ingredients did not include tomatoes. Nicoise is a descriptive term for dishes served with particular foods used by the chefs of the City of Nice, France. This garnish usually includes garlic, tomatoes, anchovies, black olive, capers, and lemon juice. Salad Nicoise is the most famous of all these dishes, consisting of potatoes, olives, green beans, and vinaigrette dressing. Even its “proper” assembly is disputed. Some people say the salad is served on a bed of lettuce and others say that tomatoes are the base. And some do not arrange the elements of the salad at all, but just toss it all together. A Russian-origin salad of potatoes with chicken, pickles, green peas, carrots bound with mayonnaise. Also known as Russian Salad or salade a la Russe. This salad appears at most festive meals in Russia. Historians believe that this salad was the creation of a French chef, M. Olivier, owner and chef of The Hermitage restaurant in Moscow, Russia in the 1860s. Originally cold roast game was used in the salad instead of chicken. A classic American fruit salad that usually consists of apples, lemon juice, celery, walnuts, and mayonnaise. 1893 – Oscar Michel Tschirky (1866-1950), maitre d’hotel, is usually given credit for creating this salad for a private party on the pre-opening of New York’s Waldorf Astoria Hotel on March 13, 1893. He was known as “Oscar of the Waldorf.” Oscar worked at the Waldorf Astoria Hotel from its opening until he retired in December of 1943. Waldorf salad – Peel two raw apples and cut them into small pieces, say about half and inch square, also cut some celery the same way, and mix it with the apple. Be very careful not to let any seeds of the apples be mixed with it. The salad must be dressed with a good mayonniase. At some point, walnuts were added to the recipe. In The Waldorf-Astoria Cookbook published in 1981 by Ted James and Rosalind Cole, it includes the walnuts or pecans. Waldorf Salad – Mix equal quantities of finely cut apple and celery, and moisten with Mayonnaise Dressing. Garnish with curled celery and canned pimentoes cut in strips or fancy shapes. An attractive way of serving this salad is to remove tops from red or green apples, scoop out inside pulp, leaving just enough adhering to skin to keep apples in shape. Refill shells thus made with the salad, replace tops, and serve on lettuce leaves. A sauce for a salad that are usually based on vinaigrette, mayonnaise, or other emulsified product. Salad dressings and sauces have a long and colorful history, dating back to ancient times. The Chinese have been using soy sauce for 5,000 years; the Babylonians used oil and vinegar for dressing greens nearly 2,000 years ago; and the ever-popular Worcestershire was derived from a sauce used since the days of the Caesar. Indeed, early Romans preferred their grass and herb salads dressed with salt. Egyptians favored a salad dressed with oil, vinegar and Oriental spices. Mayonnaise is said to have made its debut at a French Nobleman’s table over 200 years ago. Salads were favorites in the great courts of European Monarchs – Royal salad chefs often combined as many as 35 ingredients in one enormous salad bowl, including such exotic “greens” as rose petals, marigolds, nasturtiums, and violets. In the Twentieth Century, Americans went a step further in salad development – making it a fine art by using basic dressing ingredients (oil, vinegar or lemon juice, and spices) and Yankee ingenuity, to create an infinite variety of sauces and dressings to make salads the best ever. “Store bought” dressings and sauces were largely unavailable until the turn of the century. Many of the major brands of dressings and sauces available today were on the market as early as the 1920’s. In 1896, Joe Marzetti opened a restaurant in Columbus, OH and began to serve his customers a variety of dressings developed from old country recipes. Consumer acceptance led Mr. Marzetti to bottle and sell his dressing to restaurant customers in 1919. Green Goddess Dressing – A salad dressing that is a mixture of mayonnaise, anchovies, tarragon vinegar, parsley, scallions, garlic, and other spices. The Green Goddess Dressing created at San Francisco’s Palace Hotel (now called the Sheraton-Palace) in the 1920s. The Palace Hotel was built in 1875 and was San Francisco’s first grant lodging hotel. The Palace Hotel was considered the largest hotel in the western United States. Russian Dressing – Consists of the mixture of mayonnaise, pimientos, chives, ketchup, and spices. The name comes from the earliest versions that included a distinctly Russian ingredient, caviar. In 1972, Allen and Susan Benas purchased the Herald Hotel and changed its name to the Thousand Islands Inn. Needless to say, Thousand Island Dressing is the “official” house dressing at the inn. The Benas now bottle and sell the dressing at the inn and on the internet. American Food Folklore and Culinary History: Buffalo Wings, Reuben Sandwiches, and Caesar Salads, by Jim Rader, Merriam-Webster Inc. via ADS-L 28 May 1998. Bull Cook & Authentic Historic Recipes and Practices, by George Leomard Herter and Berthe E. Herter, 1969. Caesar Salad – “Who Cooked That Up?” by J. J. Schnebel. Epicurean Delight – The Life and Times of James Beard, by Evan Jones, Alfred A. Knopf, New York 1990. From Julia Child’s Kitchen, by Julia Child, Alfred A/. Knopf, Inc., 1970. In Search of Caesar – The Ultimate Caesar Salad Book, by Terry D. Greenfield, Tjicknor & Fields, 1983. Lights! Camera! Salad! – The Cobb Salad, by Vincent J. Schodolski, Tribune Staff Writer, August 26, 1998, Chicago Tribune newspaper. New York Wanders Uptown, Old and Sold, Antiques Auctiion & Marketplace, originally published 1931. Recipes Named After Restaurants Recall Bygone Era, by Fran Gardner, The Oregonian FOODday, June 19, 1999. The Brown Derby Restaurant – A Hollywood Legend, by Sally Wright Cobb and Mark Willems, Rizzoli, 1996. The crab Louis’ origin may be cloudy, but the salad’s popularity is clear, by Penelope Corcoran, Seattle Port-Intelligencer newspaper, Wednesday, July 23, 2003. The Davenport Hotel and Tower, Hotel History. The Dictionary of American Food & Drink, by John F. Mariani, Ticknor & Fields, 1983. The Food Chronology, by James Trager, Henry Holt and Company, 1995. The Secret Life of Food: A Feast of Food and Drink History, Folklore, and Fact, by Martin Elkort, St. Martin’s Press, 1991. The Waldorf Astoria Cookbook, by Ted James and Rosalind Cole, Bramhall House, 1981 Edition. Unusual Origins of Popular Recipes, by Patricia Bunning Stevens, Ohio University Press, 1998. West Coast Cook Book, by Helen Evans Brown, Little, Brown and Company (a reprint of the original by The Cookbook Collectors Library). What’s Cooking America, by Linda Stradley, Chehalem Publishing, 1997. When did Kraft first sale “fruit salad” in a glass jar? Check out: Who Invented Canned Fruit Cocktail? What do you know about the origin of Ashville Salad? I have found out it was created at the Battery Park Hotel in Ashville, N. C. before 1924. The first mention of it was in a circa 1919 Church Cook Book published by The Ladies Aid Society of the Second Reformed Church Kalamazoo, Michigan. The original Battery Park Hotel was built in 1886. If it was created before 1905 it would be the oldest “named” Tomato Aspic still popular today. I would like a date and the chef who created it.